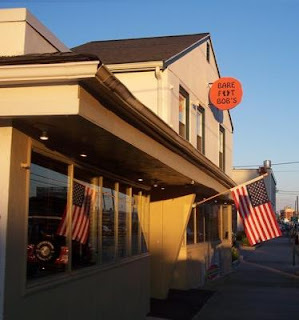 In this Kitchen Nightmares episode, Chef Gordon Ramsay visits Barefoot Bobs in Hull, Massachusetts, the restaurant is owned by husband and wife Marc and Lisa. They had always worked in the industry and decided to buy a restaurant, the restaurant is busy is the summer but dwindles in the winter. To save money, they sacked the chef and Mark cooks in the kitchen while Lisa runs the front of house and their relationship is suffering. Gordon orders the Bob’s Big Buoy platter, a Bob’s Lobster Roll and the New England Clam Chowder. The platter is disgusting and unseasoned, the lobster roll is too full of lobster, soggy and untoasted and the chowder is floury with no clams. Gordon arrives for a dinner service and Gordon is shocked when he sees a psychic in the restaurant giving readings. Gordon licks her crystal ball and asks for a reading. The food leaves the kitchen quickly but it is sent back for being cold, overcooked and soggy. Gordon examines the food storage, it is messy, there is cooked food next to raw food and to top it all off it isn’t even cold. He finds 25 old pizzas in a fridge and the oven trays haven’t been cleaned in a long time. Gordon sets about making his changes but instead of his usual Chef mentor he introduces a Business Consultant/ Accountant to get them back on track. Gordon works on the menu teaching the kitchen two new specials, an improved New England clam chowder and Fish and Chips. They visit local towns to promote the restaurant and the restaurant is given a makeover transforming it into a beach side restaurant. On relaunch night, Lisa’s brother Robby the Bar Manager hates the new decor and feel of the restaurant and walks out. Gordon arrives and senses something is up and gives him a piece of his mind. Things start to fall apart in the kitchen and the customers begin to get irate. Lisa makes the decision to stop taking orders and slow down to give the kitchen a break. The food begins to go out again and the kitchen is back on track. The customers love the food and Mark and Lisa are working happily as a team. They reverted to their old menu and were bringing the decor back to the "tiki" feel and hosted a Kitchen Fantasy viewing party on the night the episode was aired. Post filming reviews look mixed, mainly 1/2 star negative reviews on Yelp but better reviews on Trip Advisor. Barefoot Bobs closed in December 2016 and it appears that they closed suddenly as the closure was not announced. Barefoot Bobs was aired on December 97 2012, the episode was filmed in May 2012 and is Kitchen Nightmares season 6 episode 5. Perhaps the menu might not need to be made over but the cooking of the food should if no one thinks it tastes good. Felt sorry for Mark. A good guy, but I really had the feeling his wife was cheating on him. I saw no love from her, and she was on the phone constantly, secretly. Wow, why would you just assume that about someone? That's an amazing snap judgment and just so very rude and presumptuous. I know reality shows are filmed so that they're like stories and they have to create a villain but Jesus Christ, don't just go accusing people of things like that. I agree, she is cheating. Yeah all the red flags are there. At the very least she is treating him like garbage. If I was him I would ditch the scab and get a cute little wife that actually cared about me. Also, remember the waitress told Ramsey the problem was she was always going on "vacations". The husband worked 7 days a week and she only worked 2. Seems we're all forgetting about that waitress that was all over Marc though. Whether his wife was cheating we don't know, but I feel he might have been having a little something on the side with her in return. Yeah i got the same feeling , i didnt saw the love in her eyes. She was distant , taking vacations left and right , not doing her job. Showing up few times a week while her husband is there all day every day. Smells a lot like cheating. Yeah I also got the idea she might be cheating from watching the episode. She was very cold and distant to him. She went on vacations while he worked. Doing the books for the business and not being able to answer basic questions about it. I really feel for the guy, because it looked very much like he was struggling. Totally agree. I also got the feeling she was cheating. She was totally cold towards her husband. They could have made things work if he had a supportive wife. What I saw was a wife who didn't want to be there and didn't want to be with her husband. I thought Gordon did a great job and I only found this thread as I googled it because we wanted to go there. What a shame. Doesn't anyone believe in power of love anymore? I for one think they have always been destined to be together from now until the end of time! I mean, you could see her love for him while she sat, drinking martini's, and texting her "friend"! And you could see his love for her in the 5 lb lobster roll! I mean, it's lobster! I just thank God every day for Chef Ramsey, the Cupid of the culinary world! I have a lot of KN that I have recorded and am just recently got the time to view them. I can not figure out why they called in Chef Ramsey if they did not want to change anything unless it was simply to get the publicity? The owner of Mill Street Bistro called in Gordon Ramsay to generate publicity. The owner of Amy's Baking Company called in Gordon Ramsay to silence negative criticism. It is about an hour and an half from me. It would be neat to have a day trip to check it out and see how well it is doing. I am in the northeastern part of MA. I'm so confused as to why they went back to the old menu! Did Lisa's brother complain so much that they changed it or something? I mean, Marc seemed to like the change and want to help his business succeed. It's likely because he never trained the chefs in how to create most of the dishes on the new menu, nor did he give them instructions on how to order the ingredients and where from, and so on and so forth. Put simply, the show doesn't address the system around the restaurant that naturally creates the restaurant itself. Rather, the show uses money and power to create a simple one night of change that isn't sustainable. It's hard to explain, but it's all context. No amount of effort will really change anything for the better, and most of the time things aren't as bad as they seem. I'd like to reply to the comment above that says you can't believe reviews. You most certainly can believe reviews IF they aren't named 'anonymous '!!! I take my reviewing very seriously, serious enough to show my name and background of all reviews. LISTEN TO REVIEWS! Wow. Looks like the psychic on the show got it right.